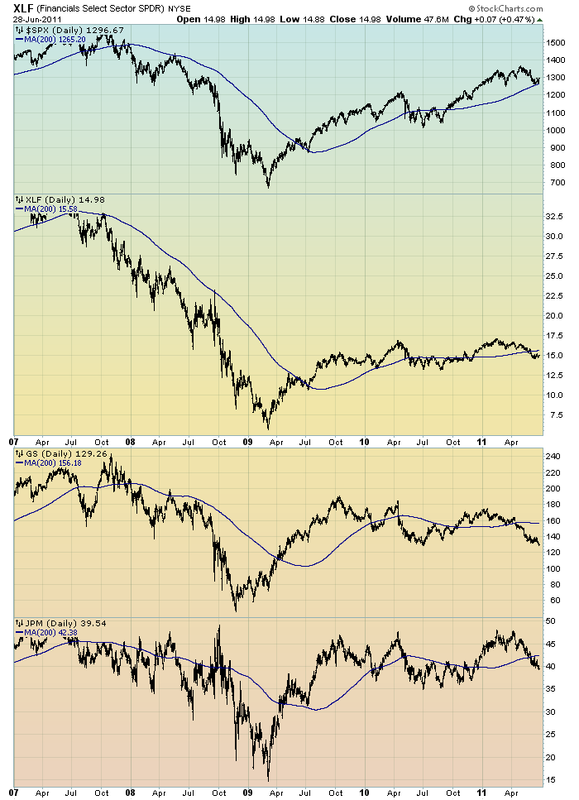 I think that the relatively poor “price action” of various financial stocks is notable. It is one of many current indications that overall stock market health is not as strong as a casual glance at the major indices would indicate. This entry was posted in Investor, Stock Market and tagged S&P500, Stock Market on June 29, 2011 by Ted Kavadas. Analysts expect the S&P 500 companies to earn $99.86 a share in aggregate this year, up 2.3% from their April 1 estimate, according to FactSet. Strategists expect $95.24, according to John Butters, senior earnings analyst at FactSet. The median gap between the two groups is now 5.6%, the biggest disparity in at least three years, he says. For 2012, the divergence is even wider: $112 a share for analysts, compared with $105 for strategists. Revenue gains may push S&P 500 profits to $99.08 a share this year, up 17 percent from 2010, after rising 37 percent a year earlier, the biggest two-year expansion since 1995, analyst estimates compiled by Bloomberg show. This entry was posted in Investor, Stock Market and tagged S&P500, S&P500 Earnings, Stock Market on June 28, 2011 by Ted Kavadas. Greg Ip: Mr. Chairman, the Committee lowered not just this year’s central tendency forecast but also 2012. And, yet, the statement of the Committee attributes most of the revision forecast to temporary factors. So I was wondering if you could explain what seems to be persisting in terms of holding the recovery back. I did see the statement says in part to factors that are likely to be temporary. Are there more permanent factors that are producing a worse outlook than three months ago? Chairman Bernanke: Well, as you — as you point out, what we say is that the temporary factors are in part the reason for the slowdown. In other words, part of the slowdown is temporary, and part of it may be longer lasting. We do believe that growth is going to pick up going into 2012 but at a somewhat slower pace from — than we had anticipated in April. We don’t have a precise read on why this slower pace of growth is persisting. One way to think about it is that maybe some of the headwinds that have been concerning us like, you know, weakness in the financial sector, problems in the housing sector, balance sheet and deleveraging issues, some of these headwinds may be stronger and more persistent than we thought. And I think it’s an appropriate balance to attribute the slowdown partly to these identifiable temporary factors but to acknowledge a possibility that some of the slowdown is due to factors which are longer lived and which will be still operative by next year. You note that, in 2013, we have growth at about the same rate that we anticipated in April. With respect to additional asset purchases, we haven’t taken any action, obviously, today. We’ll be reviewing the outlook going forward. It will be a Committee decision. I think the point I would make, though, in terms of where we are today versus where we were, say, in August of last year when I began to talk about asset purchases is that at that time inflation was very low and falling. 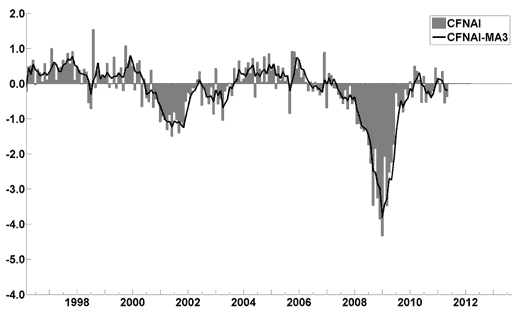 Many objective indicators suggested that deflation was a nontrivial risk. And I think that the securities purchases have been very successful in eliminating deflation risk. I don’t think people appreciate necessarily that deflation can be a very pernicious situation where — could have very longlasting effects on economic growth. In addition, growth in payrolls has actually picked up. In the four months before the Jackson Hole speech in August, there was about an 80,000 per-month payroll increase. So far in 2011, including the weak payroll report in May, the average is closer to 180,000. So there has been improvement in the labor market, albeit not as strong as we would like. As of last August, we were essentially missing significantly in both — on both sides of our mandate. Inflation was too low and falling, and unemployment looked like it might be even beginning to rise again. In that case, the case for monetary action was pretty clear in my mind. I think we are in a different position today, certainly not where we’d like to be but closer to the dual mandate objectives than we were at that time. So, again, the situation is different today than last August; but we’ll continue to monitor the economy and act as needed. In terms of the unemployment rate, though, given that growth is not much above the long-run potential rate of growth — and we have in our projections an estimate of 2.5 to 2.8 percent. We haven’t really done much better than that — it takes growth faster than potential to bring down unemployment. And since we’re not getting that, we project unemployment to come down very painfully slowly. At some point, if growth picks up as we anticipate, job numbers will start getting better. We’re still some years away from full employment in the sense of 5 ½ percent, say; and that’s, of course, very frustrating because it means that many people will be out of work for a very extended time. And that can have significant long-term consequences that concern me very much. Akihiro Okada: Mr. Chairman, I am Akihiro Okada with Yomiuri Shimbun, a Japanese newspaper. During the Japanese lost decade in the 1990s, you strongly criticized Japan’s radical policies. Recently Barry Summers suggested in his column that the U.S. is in the middle of its own lost decade. Based on those points with QE2 ending, what do you think of Japan’s experience and the reality facing the U.S.? Are there any history lessons that we should be reminded about? Thank you. Chairman Bernanke: Well, I’m a little bit more sympathetic to central bankers now than I was ten years ago. I think it’s very important to understand that in my comments, both in my comment in the published comment a decade ago as well as in my speech in 2002 about deflation, my main point was that a determined central bank can always do something about deflation. After all, inflation is a monetary phenomenon, a central bank can always create money, so on. I also argued — and I think it’s well understood that deflation, persistent deflation can be a very debilitating factor in — in growth and employment in an economy. So we acted on that advice here in the United States, as I just described, in August, September of last year. We could infer from, say, TIPS prices and inflation index bond prices, that investors saw something on the order of one-third chance of outright deflation going forward. So there was a significant risk there. The securities purchases that we did were intended in part to end that risk of deflation. And I think it’s widely agreed that we succeeded in ending that deflation risk. I think also that our policies were constructive on the employment side. This, I realize, is a bit more controversial. But we did take actions as needed, even though we were to zero lower bound of interest rates, to address deflation. So that was the thrust of my remarks ten years ago. And we’ve been consistent with that — with that approach. This entry was posted in Ben Bernanke and tagged Ben Bernanke on June 24, 2011 by Ted Kavadas. On June 22 MacroMarkets released its June 2011 Home Price Expectations Survey (pdf) results. This Survey is now done on a quarterly basis. As one can see from the above chart, the average expectation is that not only has the residential real estate market (nearly) hit a “bottom” as far as pricing; but that steady yet mild appreciation will occur through 2015. The survey detail (pdf) is interesting. Of the 100+ survey respondents, 18 (of the displayed responses) foresee a cumulative price decrease through 2015; and of those 18, only three, Gary Shilling, John Brynjolfsson, and Anthony Sanders foresee a double-digit percentage cumulative price drop. Gary Shilling remains the most “bearish” of the survey participants with a forecast of a 19.68% cumulative price decline through 2015. The Median Cumulative Home Price Appreciation for years 2011-2015 is seen as -3.10%, -2.22%, -.15%, 2.94%, and 6.72% respectively. For a variety of reasons, I continue to believe that even the most “bearish” of these forecasts (as seen in Gary Shilling’s above-referenced forecast) will prove too optimistic in hindsight. Although a 19.68% decline is substantial, from a longer-term historical perspective such a decline is rather tame in light of the wild excesses that occurred over the “bubble” years. I have written extensively about the residential real estate situation. For a variety of reasons, it is exceedingly complex. While many people continue to have an optimistic view regarding future residential real estate prices, in my opinion such a view is unsupported on an “all things considered” basis. Furthermore, (even) from these price levels there exists outsized potential for a price decline of severe magnitude, unfortunately. I discussed this downside, based upon historical price activity, in the October 24, 2010 post. 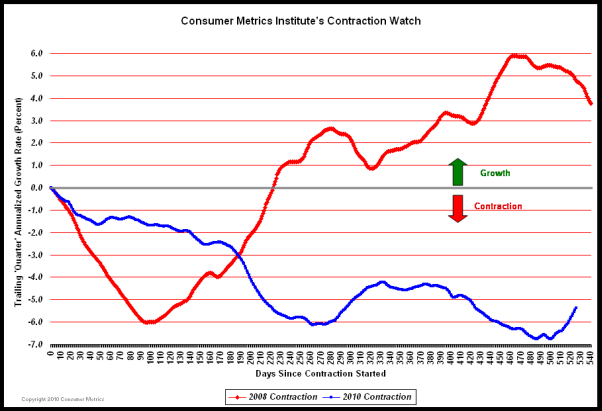 This entry was posted in Real Estate and tagged MacroMarkets, Real Estate, real estate bubble, residential real estate on June 23, 2011 by Ted Kavadas. 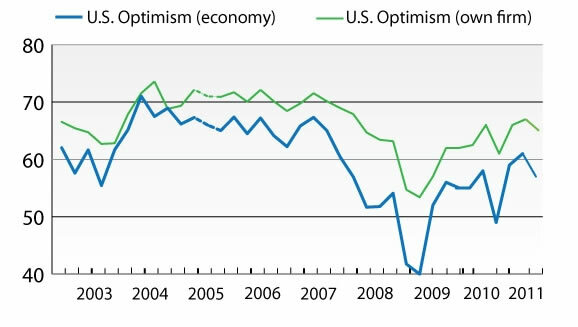 Over the past three months, executives around the world have grown more pessimistic about their nations’ economies: compared with three months ago, a smaller share say their economies improved over the past six months, and slightly more expect worsening conditions over the rest of 2011, according to our most recent survey. I find these responses to be one more indication confirming that consensus expectations regarding future economic conditions are for that of low growth with (very) little chance of substantial economic weakness. This entry was posted in Business, Economic Forecasts and tagged businesses, Economic Forecasts on June 22, 2011 by Ted Kavadas. On June 14 the Business Roundtable’s CEO Economic Outlook Survey was released for the 2nd quarter. The June Duke/CFO Magazine Global Business Outlook Survey was released on June 8. Both contain a variety of statistics regarding how executives view business and economic conditions. 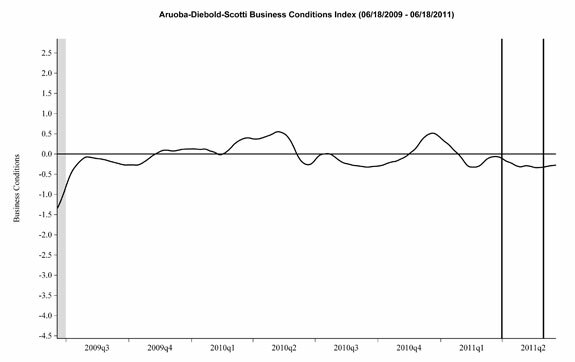 It should be interesting to see how well the CEOs and CFOs predict business and economic conditions going forward. I discussed various aspects of this, and the importance of these predictions, in the July 9 2010 post titled “The Business Environment”. This entry was posted in Business, Economic Forecasts and tagged Business, CFO and CEO Confidence, Economic Forecasts on June 20, 2011 by Ted Kavadas. These figures represent the median value across the 35 forecasters on the survey’s panel. This entry was posted in Investor, Stock Market and tagged S&P500, Stock Market on June 19, 2011 by Ted Kavadas. I find the book to be interesting and unique, although I don’t agree with some of its contents. From an overall standpoint, perhaps the greatest misgiving I have with regard to the book is the (strong) implication that previous economic episodes are highly relevant to that of today. I find that many have interpreted the above quotes (and similar findings of the book) with regard to our current economic situation in a rather disconcerting fashion. Many have interpreted these findings to conclude that since this is the aftermath of a “financial crisis” recovery and growth will be tepid; as such, the lack of recovery / growth that we are now experience is nothing to be unduly concerned about as it is “normal” from a long-term historical standpoint. I think this viewpoint is a very dangerous one to adopt because it certainly can lull one into a “false sense of security” or otherwise can breed complacency. I am of the belief, stated frequently in this blog, that our current economic situation is unique, i.e. not comparable to those in the past. As such, I am not adopting the aforementioned “don’t be worried, this is normal” mindset as we continually witness various facets of economic weakness and notably odd manifestations of such. This entry was posted in Uncategorized and tagged current economic situation on June 17, 2011 by Ted Kavadas. In the October 27, 2010 blog post (“Market Overview – Part V: Stock Market”) I showed two charts of the S&P500. As one can see from the chart, one interpretation that can be made is that of a (completed) “Cup & Handle” chart formation as denoted by the green line. I have added a red line to now denote the 1220 area. I think it would be significant if the S&P500 falls below this 1220 level now, as the 1220 level is technically significant in many different ways. This entry was posted in Investor, Stock Market and tagged S&P500, Stock Market on June 16, 2011 by Ted Kavadas.